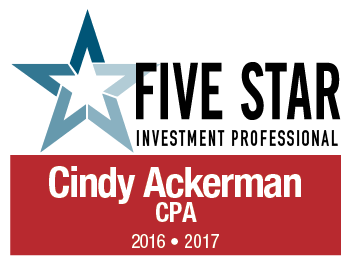 Moss & Barnett is pleased to congratulate Cindy J. Ackerman, a member of our wealth preservation and estate planning and business law teams, who was selected as a 2017 “Five Star Investment Professional.” To receive the Five Star Investment Professional award, a professional must satisfy ten objective eligibility and evaluation criteria, including client retention rate, number of client households served, education and professional designations, and pro bono and community work. Cindy is a multi-year Five Star winner. She was previously selected as a Five Star Financial Services Professional in 2016, a Five Star Estate Planning Attorney in 2014, and a Five Star Wealth Manager in 2011.